In this fourth installation of my blog series about wireless presentation devices we’ll cover one of the part I really love: vulnerability research and development. $ cd /mnt/tmp && find -name "*.sh"
# NO SHELL ESCAPE ! echo "ftpget or wget error"
This script is used to enable/disable services such as network services or USB support. Once again, comments are mine. echo "wait until kill wps is success"
$ strings ./home/boa/cgi-bin/return.cgi | grep -E "getRemote|service_onoff"
/bin/getRemoteURL.sh "%s" "%s" "%s" "%s"
$ strings ./usr/bin/snmpd | grep -E "getRemote|service_onoff|ftpfw"
$ strings ./usr/bin/CIPBridge | grep -E "getRemote|service_onoff|ftpfw"
Note: CIPBridge was purposefuly dropped because it’s a service that must be configured to talk to a Crestron Virtual Server which is only available to Crestron customers, which I’m not. Still, if anyone got that software it is worth looking into it. First, we don’t see any OID that could help us reach getRemoteURL.sh, at least from the naming convention. A cursory search through the plain MIB files didn’t bring up anything related to this feature. This is a dead end. "TC for enumerated property camSelectiveServices." Ok. Let’s give it a try by injecting a payload in the FTP account value. Note that the string must be an exact length, hence the padding of A’s. cmd += "$(pkill -f /etc/reboot.sh)"
Let’s update our sources and sinks diagram with what we learned. One path to getRemoteURL.sh via SNMP got removed, the path to service_onoff.sh got deactivated and the one to ftpfw.sh got confirmed. We’ll now move onto exploitation by abusing the web GUI running on ports TCP/80 and TCP/443. Browsing through the web UI, we end up on the “OSD setup” page that let’s you select a custom logo, which is exactly the purpose of one of our sinks: getRemoteURL.sh. Again, exploitation is straight forward as we just have to put our payload between backticks in the value field. That’s sweet, we reached both sinks and managed to get remote command execution on the device by abusing the CGI scripts. The problem is that it can only be reached by authenticated users with administrative privileges. Our next objective is to find some kind of flaw in the authorization procedures implemented by the web interface. Administrators - this is the default admin user. Moderators - this is the default moderator user. This user can manage remote viewing. Viewers - this user does not exist as is but represents users connecting to the remote viewer interface. Access to remote view is unprotected by default but if the administrator choose to protect it (see setting below), the end user must enter the association PIN code on the web interface to access the remote view. When the end user logs in with the remote view PIN code the server issues the same kind of session token that is used for administrators and moderators users. There is no authorization checks performed to verify that a valid session token belong to an administrator user or not. This means that an unauthenticated user can bruteforce the four digits PIN code - either via proprietary association protocol or by bruteforcing the login form - and, upon successful authentication, use the received session token to abuse CGIs and gain remote command execution. You might have guessed that I really like visualizations so here is one describing the different exploitation paths that you could take. hardcoded FTP credentials with write access in firmware. Those credentials could have led an attacker to overwrite firmware files on the FTP server used by other devices to fetch updates, leading to large scale compromise.. In this blog post we successfully identified lack of input sanitization in shell scripts called by two networked services: SNMP and HTTP. 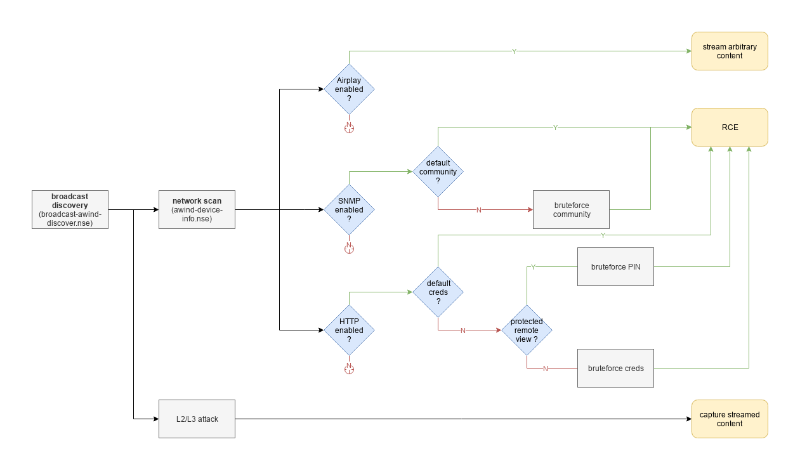 By attempting to connect these vulnerable sinks to their sources we identified valid exploitation paths that can be triggered by attackers with either knowledge of the device’s SNMP read-write community value (‘private’ by default) or the device’s admin password value (‘admin’ by default). Successful exploitation of these vulnerabilities let the attacker gain root access. That access could then be used for numerous things such as: monitoring presentations content, serving malicious EXE or DMG files disguised as legitimate Airmedia clients, modify the web interface to capture NetNTLM hashes, or simply use that initial access to go further into the network. In the next post I’ll describe how I used knowledge acquired during protocol reverse engineering to reliably identify similar devices exposed on the Internet. Ultimately, this led me on a wild OEM hunt with more than 10 different manufacturers selling around 22 different models affected by the exact vulnerabilities I described here. For the full story, just head to Man-in-the-Conference Room - Part V (Hunting OEMs).